Detailed demographic information on Franklin, AL from City Melt. 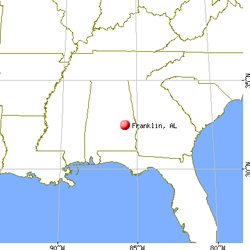 General Information on Franklin, AL from Epodunk. General Information, including history and more on Franklin, AL from Wikipedia.com. This site contains information from the National Electric Power Grid on power outages. It includes a brief explanation, when available with the locations and areas affected. Election information, along with demographics, religion and more on Franklin, AL from Sperling's Best Places to Live. General Information, including maps, charts and more from City Data.